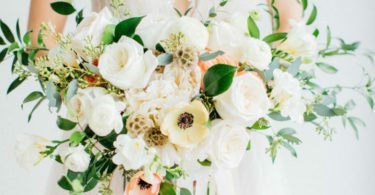 Brides who favour the brisk weather of fall will fall head over heels for this organic wedding inspiration. Set at the romantic table setting are velvet linens, lavender vases, grey flatware and tapered candles surrounded by bright pink peonies and loose greenery for an unstructured look. Following the organic theme, invitations take on hand-written calligraphy, a wax seal and floral patterns matching that of the centrepiece.